In the beautiful hills of Scotland, there’s an industrial train yard that recently got totally owned by world-class bike star Danny Macaskill. 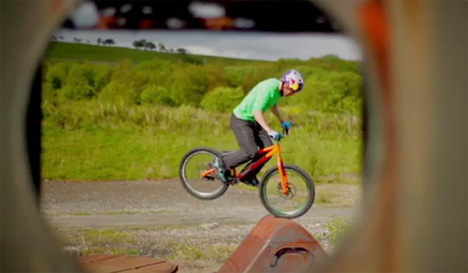 Taking his bike into an abandoned train yard for a Channel 4 documentary, Macaskill performed some of the most amazing feats we’ve ever seen anyone even attempt on a bike. It should go without saying, but just in case: don’t try any of the tricks in the video below. Ever. This Danny cat is a pro. Macaskill is so proficient on his bike that he almost seems to perform more fluidly on it than off of it. He does some crazy jumps, daring flips, insane hops – and by the end of the five-minute video your mouth will definitely be hanging open in amazement. The short video is called Industrial Revolutions and it was filmed as part of Channel 4’s Concrete Circus documentary.